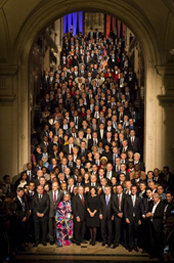 Attended the Climate Summit for local leaders in Paris, France. This was the largest convening of cities on climate change. Initiated the Business Roundtable to better understand and provide policy direction for improving Richmond’s business climate, which is essential to increase jobs, increase municipal revenue, and increase economic diversity and opportunity. Secured final agreements and funding to initiate ferry service between Richmond and San Francisco (scheduled to begin in late 2018). Commenced a strategy to ensure a productive future for Hilltop Mall and the Hilltop Area businesses. Raised funds from the business community to launch the Richmond Branding and Marketing Study to improve the image of the city and market the City as a place to live, work and play. Provided support to Richmond Main Street Initiative to promote economic development revitalization efforts. Maintained active participation in the Berkeley Global Campus Working Group meetings and fostered personal relationships with the University staff and Chancellor Dirks. Initiated a study of utility infrastructure at Point Molate by PG&E, EBMUD and Veolia. Moved forward with funding and selection of consultants for completion of the Climate Action Plan and Zoning Ordinance consistency with the General Plan. With the support of the City Council, successfully appointed my replacement, Vinay Pimple, to the City Council. Mayor’s office launched a branding and marketing study for Richmond. City of Richmond completed three important public works projects with a combined cost of over $50 million: Family Justice Center; Brad Moody Underpass; Wet Weather Storage Facility; Bay Trail Ferry Point Loop and Plunge Section of Bay Trail and Santa Fe Union Park. The politically contentious Riggers Loft was completed and occupied by the Port of Richmond and R&B Cellars, a winery, amid a clash over relocation of the Red Oak Victory. The Red Oak Victory is scheduled to be moved (once) in February 2016. Sponsored an adopted City resolution that banned the use of pesticides in municipal operations for 12 months as a pilot program. Provided leadership in the successful effort to plan and fund a bike and pedestrian path to safely cross I-580, access Point Molate and the San Pablo Peninsula and the upper level of the Richmond-San Rafael Bridge. Held regular meetings with community members to draft an urban agriculture ordinance. Attended and provided updates at every Richmond Neighborhood Coordinating Council meeting. Re-started the Urban Forestry Advisory Committee to bolster funding and volunteer efforts for tree planting in the city. Helped facilitate conclusion of challenges to the Chevron Modernization project, resulting in millions of dollars scheduled to be released to the City in June for community benefits. Met with Interior Secretary Sally Jewell and National Park Service Director Jon Jarvis for a tour of Rosie the Riveter WWII Home Front National Historical park. Design for Unity Park on the Richmond Greenway, using a $5 million grant, continues to move along. Kennedy Park was renovated by volunteers organized by the City of Richmond and the Trust for Public Land. The EPA recognized Richmond as a Green Power Community. The draft Richmond Bay Specific Plan was completed with public comment due in December 2015, and the South Richmond Transportation Connectivity Plan was adopted. Secured Section 8 vouchers for the relocation of Hacienda residents, allowing the tenants to find new housing and prepare the public housing complex to move forward with planned transfer and rehabilitation. Changed the demeanor of City Council meetings and implemented changes including elimination of standing committees and the 5-minute rule to streamline and reduce the length of meetings. Not a single meeting has extended past 1:30 PM, and most have ended substantially earlier. Created a new three-member City Council WCCUSD/City Coordination Ad Hoc Committee, including collaboration with the City’s Bond Oversight Committee representative to strengthen academic outcomes and improve facilities for Richmond youth. Began planning, along with Vice-mayor Myrick and City staff, for implementation of the Richmond Promise Program. The Richmond Promise Scholarship Program officially launched on January 26! Started the process of considering annexation of North Richmond, beginning with a supporting resolution by the North Richmond MAC and a feasibility study by the City of Richmond. Joined with twenty-eight mayors to sign on to and file an amicus brief in support of Obama's recent executive actions on immigration, which are currently the target of alawsuit from 25 states, led by Texas. Threw out the first pitch for the Richmond Little League baseball season. In addition to these specific accomplishments, I have fully appointed all authorized members to five City Boards and Commissions and partially filled numerous vacancies on others; my office has participated in planning meetings for the City’s My Brother’s Keeper Summit, and hosted an art instillation at the mayor’s Office in partnership with NIAD. Moreover, Richmond was selected as one of seven cities nationwide to win a $30,000 Cities of Service Grant as part of the Love Your Block Program. I have made numerous presentations to business organizations, neighborhood councils and the Contra Costa Grand Jury, attended conferences including the Local Government Commission Ahwahnee Conference in Yosemite and New Partners for Smart Growth Conference in Baltimore, traveled to Washington DC to meet with HUD officials along with Congressman DeSaulnier, attended the ABAG State of the Region Symposium, participated in two League of California Cities Environmental Quality Policy Committee meetings and attended dozens of regional organization meetings, including MCE, CCTA, WCCTAC, BCDC and Contra Costa Mayors Conference.